To put it straight - I'm not a fan. I think this is a show that tries too hard to be funny and meaningful and mysterious, resulting in obvious strains to character dialog, plot, and behavior. Things come across manufactured rather than heart-warming, and I could care less about any of the pairings (even the boy-boy one, which I'd normally be all over). The reason? The final couples are all ridiculously predictable. Even from episode 1, it was clear to me that the "marriage reveal" would definitely not involve the main pairing. Why? Because that's not how dramas work. If you've ever seen a rom-com with a "mystery reveal" of some sort (which I guarantee you have - e.g., Definitely, Maybe), you'll know that the straightforward, true pairing is never one that comes out so directly. What happens instead is a side-pairing is announced, followed by a grand gesture involving the true pairing. The grand gesture here is the pregnancy, which I find rather clunky. Her line of "Honey, can I just have one drink?" was so fake and clearly just to show us the 3-way reply. I mean, she's not stupid, so she probably understands the whole fetal deformity risk she'd be taking with her "one drink". Meaning the question was out of character and plain obvious in its purpose. I find much of the story to be like that. Even the trying-too-hard to be sad moments, like the cancer father story. It just makes no sense. How many radio stations are doing a jeans giveaway? If she's resubmitting, wouldn't it be obvious it's the same person based on name and address? When the fundamental logic to a supposedly realistic story arc suffers from large holes, I find myself immediately removed from the world and apathetic to its characters. And while I can empathize with her family's sadness at cancer, at this point I care so little for either of the parents that I was momentarily happy that the annoying, screechy father would finally be out. This paired with the constant crying and mopiness just made me want to slap them. Cancer is a fact of life, as is death, and I don't need to be given a moral lesson from a show that's so clearly trying to make me run for tissues. I think this is also a drama that requires you to be Korean, or to have huge awareness for Korean pop culture to really get. Most of the references are over my head, which understandably takes away from the squee and fun factor. Never heard of H.O.T. before this, or Eom Ki Joon. Call-backs only work if they really call me back to my youth, and this isn't it. There's also a visual disparity with the cast in playing their 97 versus current-day versions. The ones who look appropriate in 97 look laughably young in 2012 (like really, they couldn't even have tried to age a little?) while the ones that look ok in 2012 look far too old in 97. Nobody looks the same at 33 as at 18, and I take offence when a drama is too lazy to even make an attempt at being physically accurate. At this point, I think it's VERY CLEAR that Yoon Jae and the lead girl end up together. Neither of the other options (gay man and older bro) are even remotely viable. I hate that they're still trying to play coy with something so apparent. What would hugely raise my respect for this story is if it ended up being not Yoon Jae (e.g., if cuter older bro won out) or even if it was none of the three guys (but the show already eliminated that possibility with the 3-way reply). Sadly, we'll have another predictable fairy-tale first love story, which I'm so sick of at this point. Boring boring boring stuff overall. The story just crawls and I'm tired of it. But not everything can be as awesome as To the Beautiful You or Faith, so I'll have to use it as a buffer between weeks. I know that's your own opinion, but srlsy? 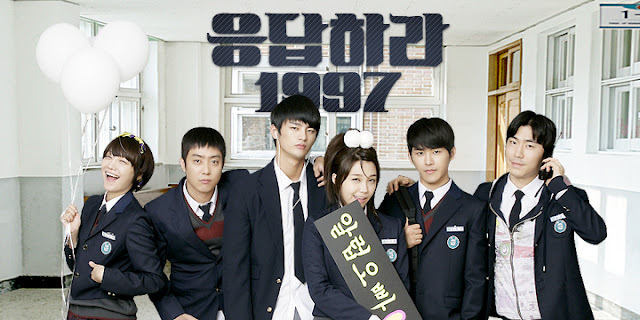 reply 1997 is not your typical kdrama. I'll give it 10 stars actually. P.S you're the only one who thinks that this drama is boring. Haha, nice trolling. You caught me for a second there until i read TTBY part.